Today, we are excited to share with you our new logo, website, and video featuring Laquida Landford, a woman who earned a bike and participated in a pilot leadership development training program at the Community Cycling Center. After celebrating our 20th anniversary last year, we decided it was time to refine our look, while directly reflecting our mission in our visual identity. Throughout the past year, we worked hard on overhauling our website and lovingly refurbishing our new logo. Although our look is new, our core values and mission remain the same. Our new website will allow us to share our stories, our programs, and our bike shop services in a more compelling and impactful way. We hope to grow our blog into a more robust community space where more of our partners can share stories like Laquida’s. Additionally, we finally have a website that is responsive and friendly on mobile phones, so that more of our community members can access our site. Our logo represents our commitment to building community through bicycling. 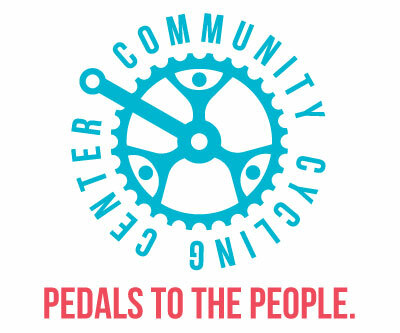 Hiding inside the cog design of our new logo are people that are powering the Community Cycling Center forward. The circular logo is a homage to our past logo, while updating it to show the community that makes our mission possible. 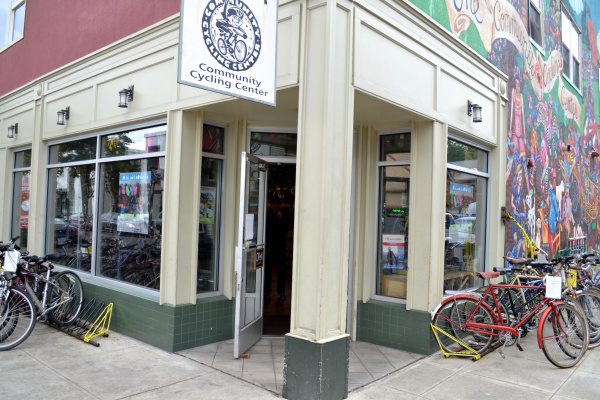 This is not the first time the Community Cycling Center has changed its look. Take a look at the first logo that was on our original bike shop located at 24th and Alberta Street in 1994. That’s our founder, Brian Lacy, in the photo. Here’s our most recent logo that you may be more familiar with on our bike shop located at 1700 NE Alberta Street. The brand refresh is made possible thanks to several organizations and people. The talented people at BPN–a full-service creative agency in downtown Portland–took us on as a pro bono client and worked with us for over a year on refreshing the Community Cycling Center logo, tagline, and website. It was a lot of hard work and we appreciate all of our supporters that were involved in the feedback process along the way. Our web firm, Totally, translated the designs from BPN and programmed a fabulous new website, allowing us to share our stories, our programs, and our bike shop services. Our printing sponsor, Alphagraphics Hillsboro, a longstanding partner of ours, printed our new letterhead, business cards, and some of the new signage that you will see in our bike shop. We want to say a big thank you to Laquida Landford for sharing your story with NW Documentary who produced the beautiful video. We hope you enjoy our new website and look. Let us know what you think!